This is PowerShell tutorial script to understand how to copy existing database with PowerShell and SMO. We will be using Transfer Class from SMO. If you wish to just generate the copy script then there is an option to just script out the transfer using the ScriptTransfer method. When we are ready to bring the data and schema over, we can use the TransferData method. Once you are done with successful execution of this PowerShell Script, Check whether you database is copied or not. 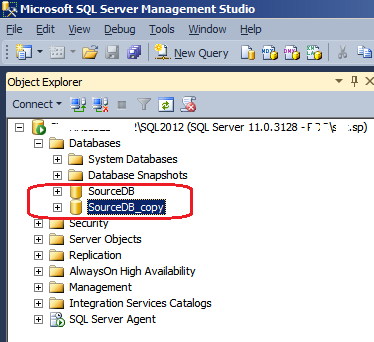 Go to SQL Server Management Studio and check the user databases in Object Explorer. You may need to refresh Databases folder from Object Explorer. Let me know if you have any queries on this PowerShell Tutorial. I just want to mention I am just beginner to blogging and seriously loved this web page. Most likely I’m planning to bookmark your website . You surely have perfect well written articles. Thank you for sharing with us your website page. user in his/her mind that how a user can know it. So that’s why this post is amazing. Thanks! I know this web page presents quality based posts and additional stuff, is there any other web page which provides these data in quality? Hola! I’ve been following your blog for a long time now and finally got the courage to go ahead and give you a shout out from New Caney Texas! Just wanted to say keep up the excellent work! Oh my goodness! Awesome article dude! Thank you so much, However I am experiencing problems with your RSS. I don’t know why I am unable to join it. Is there anybody getting similar RSS problems? Anyone that knows the answer can you kindly respond? Thanx!! We absolutely love your blog and find many of your post’s to be just what I’m looking for. can you offer guest writers to write content in your case? I wouldn’t mind creating a post or elaborating on a number of the subjects you write related to here. Again, awesome web site!